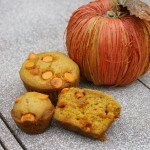 A moist delicious muffin with sweet pumpkin spice chips! You will use a regular size muffin pan and this recipe makes 2 dozen! You can line the muffin tins or spray the pan with non-stick cooking spray. If I use muffin liners, I like to spray the inside of the liners to make removal even easier! Now take a large bowl and add your eggs, sugar, pumpkin and oil and mix until well blended and smooth. In another bowl mix your dry ingredients (except your chips) together. Add the dry mixture slowly to the wet mixture and mix well. Last you will fold in one bag of pumpkin spice chips. Fill your muffin pan with the Pumpkin Spice Muffin mixture until at least 3/4 full to almost full. I actually had some left over batter and was able to make one pan of mini muffins! Once your muffin pan is full, sprinkle pumpkin spice chips on the top of all the muffins before baking. You may have some leftover chips depending on how many you want to sprinkle on the top. This is optional if you prefer to not have any extra chips on the top. Bake for 15 minutes or until a toothpick inserted into the center of a muffin comes out clean. You can substitute apple sauce for some or all of the oil, but your muffins may not be as moist! If you can't find the pumpkin spice chips you can use cinnamon chips or chocolate chips.